Harvey Evacuees Need Medical Attention And Mental Health Care : Shots - Health News With thousands of people displaced, health workers are trying to address the immediate medical needs of evacuees as well as mental health issues made worse by the disaster. 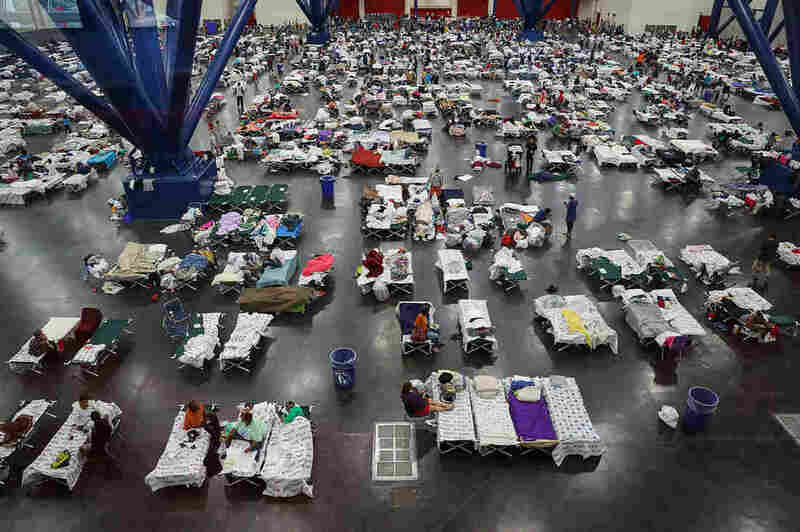 Evacuees fill up cots at a shelter set up inside the George R. Brown Convention Center in Houston, Texas. Before the storm hit, Harris County Public Health sent out a number of messages warning residents of to avoid hazards presented by flood waters: downed power lines, sewage contamination, rusted nails and the possibility of critters in the water — everything from snakes to spiders to alligators. Now that people are showing up in shelters, efforts are turning to helping people with both health issues arising from the flood — including respiratory and gastrointestinal problems — and with getting care for preexisting conditions, some of which can be life-threatening if not treated promptly. "That doesn't even obviously take into account the numerous injuries and the mental health issues that all come into play. So it's a very complicated response system," Shah tells All Things Considered host Ari Shapiro. Hurricane Sandy Stranded Dialysis Patients. Lessons Learned? Shah remembers that after Hurricane Katrina in 2005, health workers set up clinics in shelters and asked people with anxiety or schizophrenia to come forward. Many were not willing to do so. "So we actually had to fan into the shelter to identify ourselves mental health issues," Shah recalls. "That's a big component and something we're also mindful of now." At the George R. Brown Convention Center in downtown Houston, licensed clinical social worker Brittany Burch showed up to help some of the thousands of people who have taken shelter there. As she tells NPR, she's already seeing and hearing a lot of distress. "A lot of people really overwhelmed, stories of having to jump in a boat or get a helicopter out, wade through waist-high water, losing everything," she says. "So just a lot of people in shock, trying to adjust to what's happened and what happens from here." Burch has heard from people who, before the storm, already suffered from chronic depression, post-traumatic stress disorder, bipolar disorder and other illnesses. "Some people haven't been on their medications for a few days," she says. "So there's a lot of stress just being here, and then the extra mental health needs that arise in the midst of this [are] also very challenging." "There is such an unmet medical need," says Kristin Malaer, another social worker who also showed up to volunteer. "Just going and connecting with people, you find out so many of them are diabetic or so many of them have chronic medical illness, that serving them all is pretty overwhelming." Among the more pressing medical issues is getting treatment to the sizeable population of people on dialysis. DaVita, a leading provider of dialysis services nationwide, says the company normally serves approximately 6,700 patients in Houston. About a third of their 100 or so centers in the city remain open for all patients who need dialysis, according to Chakilla Robinson White, who oversees operations at DaVita's dialysis centers in Texas and neighboring states. "We are trying to call proactively and ensure that those patients we know need treatment are seeking treatment, either with us or within a hospital system," White says. "We're like, 'Hey, we would like to see you in a center. What do we need to do to be able to get you here?' "
For patients they reach who are stuck in their homes, surrounded by flood water, they're trying to arrange transportation. "We're alerting the authorities that this is a medical emergency so that they can get prioritized," she says. Gail Torres, senior clinical communications director for the National Kidney Foundation, says forgoing dialysis treatment for even a day can be extremely dangerous, particularly to the heart. "Certain toxins can build up, but most importantly, potassium and fluid can affect the heart," she says. "If you have a buildup of potassium, depending on what their baseline is, it can send them into cardiac arrest." She says that delays in treatment can result in cumulative damage, as they saw after Hurricane Katrina in 2005 and Superstorm Sandy in 2012. In Houston, DaVita is working to bring in enough staff to keep dialysis centers open, calling in workers from other cities and states and also finding ways to get their Houston-based colleagues to work. "We're working on bringing in boats to actually get our teammates in some of the neighborhoods where they're unable to escape through the flood," White says. "It's amazing how many teammates have had hardships themselves, losing part of their homes and still showing up to treat our patients."